Hay Festival Segovia 2016 began last Saturday September 17th and will last until Sunday 25th. This year will also see big names of the universe of the arts and letters such as writer Deborah Levy or actress Julie Christie. The present edition has India as invited country, in order to celebrate the 60th anniversary of the Indian Spanish Diplomatic Relations. 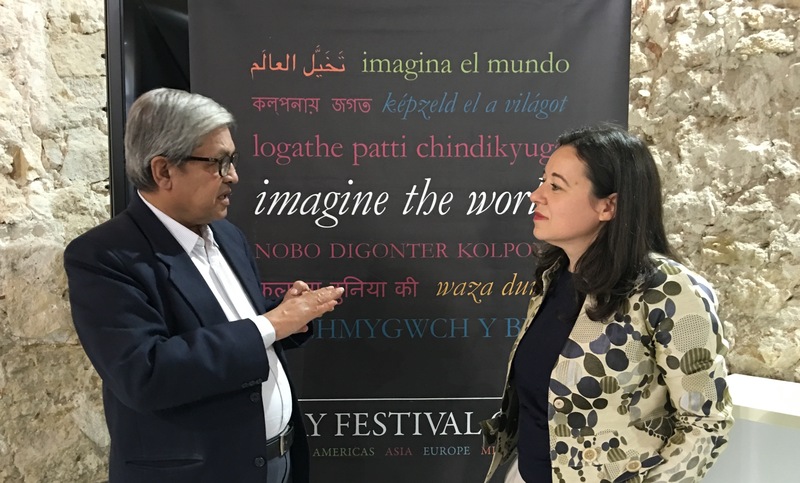 On Monday 19th Humanities Professor Susana Torres had a conversation with journalist Dileep Padgaonkar, Former Editor at The Times of India. 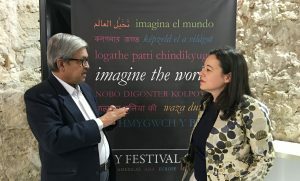 The event was an overview of Dr. Padgaonkar extraordinary life, from his times of doctoral student at l’Université Paris-Sorbonne to his leadership of India’s most relevant opinion maker. With an exquisite intellectual approach he shared with the audience several insights to understand the course of Indian’s history since its independence from the United Kingdom. On Tuesday 20th Vice Rector Miguel Larrañaga held a conversation with writer and cultural activist Namita Gokhale. This interesting talk versed on two themes, her literature works and the Jaipur Literature Festival. With an amazing pedagogic style Ms. Gokhale decostructed the main themes in her literature, based in women and love. Her speech was clear and well structured, a pleasure to hear and learn. She also talked about the Jaipur Literature Festival, a project she launched 10 years ago and now co directs with writer William Dalrymple. 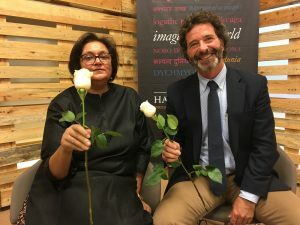 These two talks were the perfect warmup for this edition of Hay Festival Segovia and for this years IE University’s cycle of conferences India Present and Future. This series of lectures will officially start on October 20th with a talk on Indian Economy by Pradeep Bhargava (Chief Representative India, Sri Lanka, Bangladesh La Caixa) and Patricia Gabaldón (Assistant Professor of Economic Environment at IE Business School) Chaired by Kiron Ravindran (Associate Dean of the Masters in Management Programs at IE Business School). And will also include renowned personalities such as the above mention Namita Gokhale or Spanish writer Javier Moro, among many others. Stay tuned! Below you can find a list of this year’s winners covering the length and breadth of our broad spectrum of nationalities. It clearly reflects the richness and plurality of interests and culture of IE students and alumni, in all IE schools, and at every level of our higher education programs. María Isabel Macías Núñez (Madrid, Spain, 1993, Master in Corporate Communication, 2016), for Un hombre con el abrigo largo. Elisa Carrara (Cuneo, Italy, 1987, Master in Visual and Digital Media, 2016), for Una expresión sardónica. Sofía Quetglas Diz (Madrid, Spain, 1992, Master in Management, 2016), for De vuelta a Barcelona. María Isabel Macías Núñez (Madrid, Spain, 1993, Master in Corporate Communication, 2016), for Muerte en María de Molina. Sofía Rondán González (Barcelona, Spain, 1992, Master in International Relations, 2016), for Nadie. María Isabel Macías Núñez (Madrid, Spain, 1993, Master in Corporate Communication, 2016), for Primer round. Jesús Arcenegui Méndez (Madrid, Spain, 1997, Bachelor in International Relations, 2019), for Quiero. Do Xuan Hoang (Hanoi, Vietnam, 1996, Bachelor in Architecture, 2020), for Aroma. Alyssa Flora Najafi (Palo Alto, U.S.A., 1989, Master in Visual and Digital Media, 2016), for Death Valley. Marieke Elisah Lensvelt (Muscat, Oman, 1991, Master in Visual and Digital Media, 2016), for The Other Side. Joy Cierrea Archer Holmes (Daytona Beach, U.S.A., 1993, Bachelor of Laws, 2017), for Beautuful Imperfectiums [sic]. Sumedha Sharma (Kanpur, India, 1987, Master in Corporate Communication, 2016), for One Place – A Haiku. Malak El Halabi (Baakline, Lebanon, 1992, Master in Market Research and Consumer Behavior, 2016), for 23. Nathalie Lagard (Bratislava, Slovakia, 1994, Bachelor in Architecture, 2017), for Rendez-vous. Romain Odin Lepoutre (Manila, Philippines, 1993, Bachelor in Architecture, 2019), for Hangman. Jazmin Cristina Harb Andrade (Guayaquil, Ecuador, 1991, Master in Visual and Digital Media, 2016), for Dancejazz. Montserrat Gutiérrez Mesegue (San Diego, U.S.A., 1995, Bachelor in Architecture, 2018), for Apparently. La cruzada contra las humanidades en Europa no ha llegado a ese punto, pero hace tiempo que se les asigna un papel secundario. Diferentes organismos advierten desde hace años de la necesidad de formar a más estudiantes en lasespecialidades STEM (graduados en ciencias, tecnología, ingeniería y matemáticas). La semana pasada la comisaria belga de empleo, Marianne Thyssen, denunciaba que en un continente con más de 20 millones de parados no es admisible que el 40% de las empresas no encuentren trabajadores con habilidades para innovar. One of the key aspects of IE mission, of our whole academic community, is the humanist point of view, the capacity to acquire a different voice in and insight of the world around us, to be able to see and articulate new possibilities of meaning. In order to foster further the presentation before the whole IE community of such other voices and insights from our students and former students, the IE Humanities Center, our research and teaching center specialized in the Humanities, convenes in collaboration with IE Foundation the IE Foundation Prizes in the Humanities. The IE Foundation Prizes in the Humanities are convened in four different categories: Short story in Spanish and in English, Poetry in Spanish and in English, Short Film and Photography, and they are opened exclusively to students or former students of IE. The three best works in each category or subcategory will be duly recognized. The prizes, granted by IE Foundation, will consist of a collective print edition of the awarded pieces together with a pen-drive of their digital versions together with the awarded short films. The edition will have a distribution of 1,500 copies, a hundred of which will be given to each winner for their personal, non-commercial use. We encourage you to participate and show your capacity for expressing yourself with another voice or another insight, so we can all realize it. “Nunca pude volver a España, pero quisiera que algo de mí, mi biblioteca, acabara allí”. Consciente de que no le quedaba mucho tiempo de vida, la historiadora Isabel de Madariaga, hija menor del insigne intelectual y político español Salvador de Madariaga, que fue embajador de la Segunda República, contaba, con lágrimas en los ojos, que ese era uno de sus últimos deseos. Con una madre historiadora, la británica Constance Helen Margaret, Isabel de Madariaga llegó a ser una historiadora de referencia internacional por sus estudios sobre la Rusia de Catalina la Grande, emperatriz entre 1762 y 1796. Sin embargo, apenas es conocida en España y, hasta hace no mucho, lo era también para los estudiosos de la historia rusa en nuestro país. Quien se encargó de cumplir esa postrera voluntad de Isabel de Madariaga fue la historiadora eslavista Susana Torres Prieto. “En 2010, fui elegida en Reino Unido presidenta de una asociación científica de estudios sobre la Rusia medieval, yo era la primera española con ese nombramiento, e Isabel pertenecía a esa asociación. Al ver mi nombre, me escribió un correo electrónico en el que decía que quería pedirme un favor y que fuera a verla a su casa de Londres”.